Handel Street Projects is pleased to announce the first solo exhibition with the gallery by British artist Lucy Heyward. The exhibition title Erehwon, references a novel of a similar title by Samuel Butler. 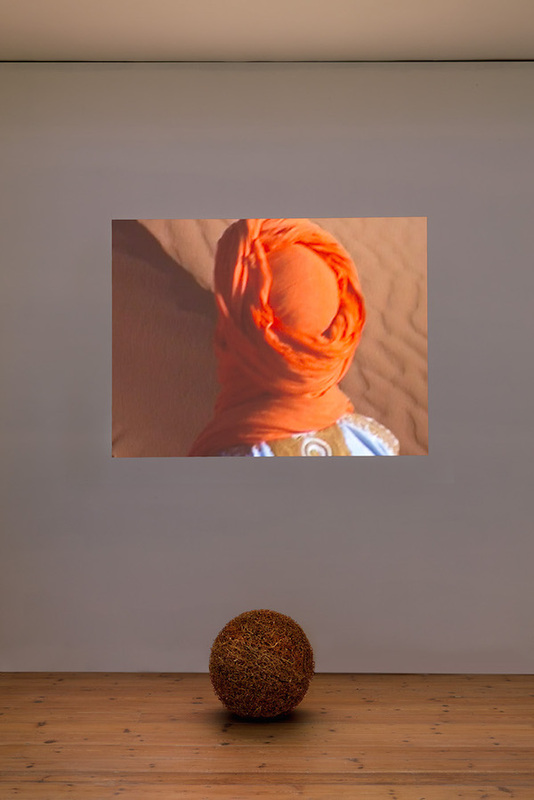 It consists of four video works, filmed in three deserts in Africa and the Middle East, along with related objects. Anonymous, faceless men walk on a seemingly endless journey across a vast, undulating desert landscape. The movement of the handheld camera is synced to the sound of the slowed-down drumming music from a nearby village, continuously focusing on one point: the back of a man’s head. The desert evokes both our future and a state without borders that we might aspire to. Present in unimaginable quantities over the entire globe, pure, often surprisingly habitable and much easier to protect than other more demanding ecologies, deserts are a neglected part of the modern world, the site of imaginary projections for many in the West. The films are also about anonymous individuals and their relationship with space, anonymous solitude, a curious place of transition between two realities. ‘Deserts might offer us new ways to think the earth, the unterritorialized’ (Deleuze&Guattari). The boundaries between space that we associate with ownership and urbanisation are absent, suggesting a space that offers new possibilities and horizons, yet Heyward is careful to never show us the walker’s face. Are they walking towards something or away from something? The lack of any facial information here, deprives us of any certainty. Trained as a sculptor, Heyward always used a wide range of found materials and in recent years video and photography. Her objects and imagery derive directly from the world as it exists, not from the recesses of a private imagination that must search itself to produce the substance of invented images. Glass and sand are very present in some of her early sculptural works and they are reappearing here in the form of small objects accompanying the videos. After graduating from the MA course at Goldsmiths Lucy Heyward showed in many group exhibitions including Whitechapel Open, Arnolfini Gallery, The Approach, John Hansard Gallery, Gasworks, Chisenhale Gallery, Handel Street Projects and solo shows at Dundee Contemporary Arts and Artsway New Forest. She was artist in residence at Camden Arts Centre, and has been a recipient of awards from the Rootstein Hopkins Foundation and the London Arts Board. Lucy Heyward’s new multiple Time Warps will be available at the opening. The Artist would like to thank Lea Barisset, Barney Curnow, James Davy UCL, Stevan Lung, Evan Manifattori, Mohamed Oubadi and family and Hilal Zawideh, for their kind help and support.